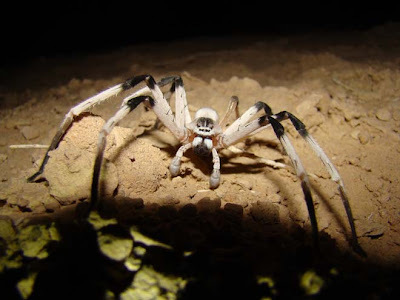 A new spider has been discovered in Israel. Most new spiders are small, but this monster has a leg span of 5.5 inches. Though it looks highly mobile, Cerbalus aravensis is a spider after my own heart -- it's a sit-and-wait hunter. Nocturnal, and most active during the intense heat of the summer, it constructs a camouflaged den with a gotcha-door. When unsuspecting insects or lizards walk by - BAM - it strikes. Instant meal. That's lazier than fast food. It's right up my alley. Thanks for the link, Jeff and David. What are those long things with a pom pom on the end hanging off its head? TERRIFYING. Those are the pedipalps, Cate! They're like specialized mini legs or antennae that the male spiders use to transfer sperm to the females. They tend to be more developed in males for that reason. It looks like it's wearing boxing gloves! Did you notice how in the up-close version his face really resembles a monkey? This is one cool spider! I'm not generally scared of spiders but that one is just got that "air" about it. OMG! What a beautiful spider!!! That is one incredible spider. I think I'm in love. Don't we have enough big spiders already...? I'm saying that because I'm afraid of spiders. On the other hand, it does look rather stylish with those black bands on its legs. 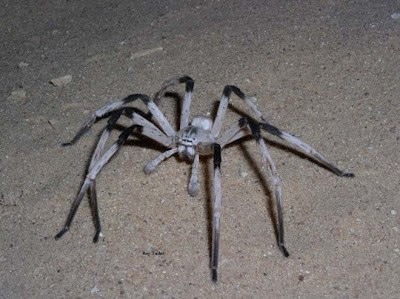 A new species of spiders was found in the Middle East. This enormous spider, which from left leg to right leg, is named the Cerbalus aravensis. Although spiders are known to be creepy and crawly-hated animals these critters are in danger. Their homes are dissapearing while construction is going on in the sand dunes of Isreal.